ISLAMABAD: The tragic death of a child servant has sparked off a new concern in the civil society section and also exposed an obscured, cruel facet of the society. Six-year old Laiba died after being beaten by her employers who were later arrested by the police in Harbanspura, Lahore on Monday. Society for the Protection of the Rights of the Child (SPARC) sturdily condemned the incident and demanded the government to take firm measures to check growing violence against child domestic labourers and respond to the situation by notifying Child Domestic Labour in the list of banned occupations under the Employment of Children Act 1991. The torture to death of 6-years-old Laiba is the 13th such case of murder of child domestic labourers reported in the media since January 2010 starting from the death of Shazia Masih, noted SPARC. Laiba’s heartbreaking story is only one of the many stories of tens of thousands of little boys and girls trapped in sweatshops, or as house-maids, often without enough food, sleep or regular salary. According to an ILO (2004) report there are 264,000 children employed as domestic servants in Pakistan which is one of the worst forms of child labour. The children working as servants often become victims of physical and sexual abuse and meagre resources prevent them from highlighting their abuse and mistreatment. Exports lament that the lack of statistical data on child labourers was hampering them in doing their work. Children working as servant are also denied education, which is now a legal right for every child between the ages of six and 14. The fact calls for both the government and ordinary people to do more to end the exploitation of young children. What is more worrisome is that many educated families also choose child workers because they are cheaper than adults and can be intimidated to do extra work. Experts believe that the main reason behind this gruesome figure is poverty, large family sizes, social attitudes and low literacy rate. Legally, no child under the age of 14 is allowed to work under any circumstances. 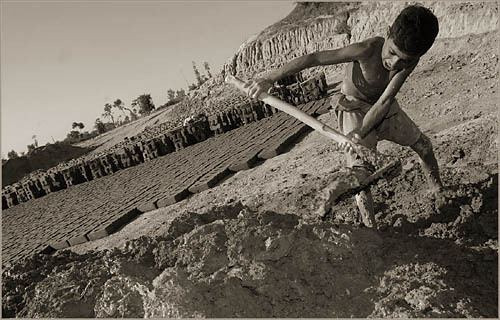 But the horrid reality verifies that laws alone will not end child labour. One of the biggest challenges on the ground is “changing a mindset which does not see any shame in child labour” and SPARC along-with other child rights’ NGO is fighting this mindset by educating the new generation who can start by boycotting goods made by child workers. The NGO has also printed stickers saying “This house is child labour free” to help change the mindsets about child labour in the country.